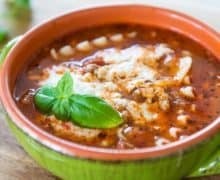 Lasagna Soup - Easy, Cheesy Lasagna Soup is Comfort in a Bowl! 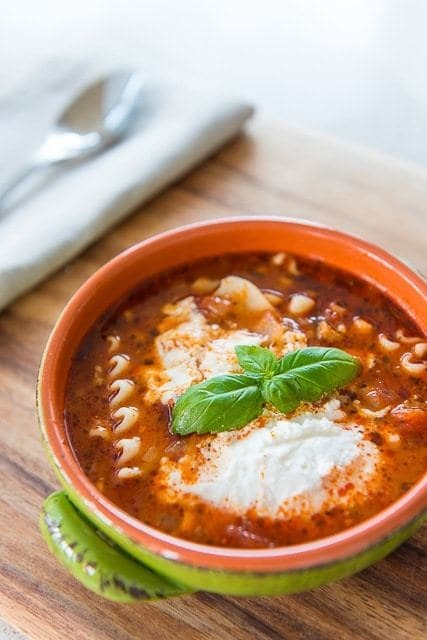 This Lasagna Soup is easy to make, and absolutely wonderful to eat on a chilly day. It’s filling, comforting, and cheesy! 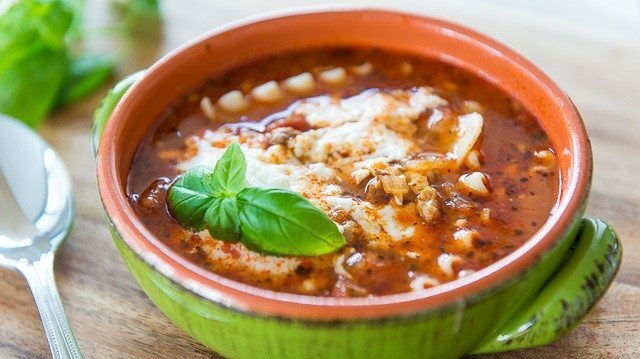 Even though I clearly have a love for all kinds of soups, Cheesy Lasagna Soup has always been one of my all-time favorites. Let me count the reasons why. The most obvious reason why I love this soup is because it’s basically a brothy soup version of lasagna, which will always be one of the most comforting foods on earth. No need to explain that one. Next, you know when you eat French Onion Soup and you get all that wonderful gooey stretchy stringy cheese with every bite and spoonful of soup? You get the same effect here too. Swoon. And finally, this soup takes a little over 30 minutes to make. No extended simmering times required! It’s a pretty great soup to make for a quick and easy weeknight meal, and I make it all the time. One thing I love about making my own soup at home is being able to control the seasoning. I can’t stand when soup is too salty! Because then you feel compelled to water it down to dilute the saltiness, but then you’re also diluting the flavor. 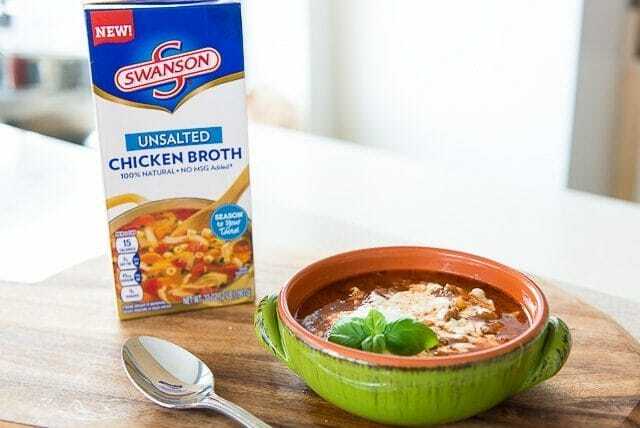 It’s for this reason that I love, love, love Swanson® Unsalted Chicken Broth for my soups, and I’m also using it for today’s recipe. 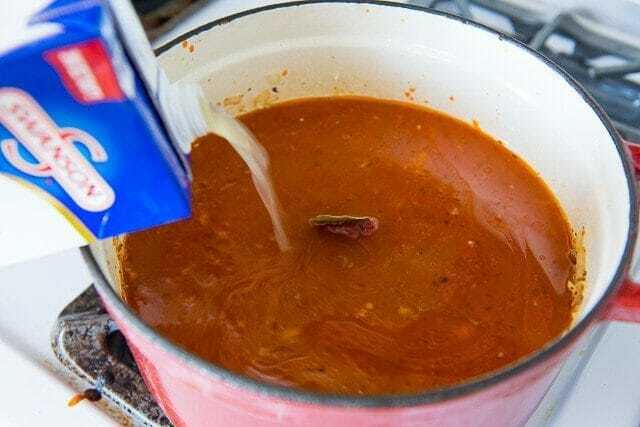 Using this broth lets you season your soup how you like it, and it’s great for people who want to add a richness of flavor, while allowing the natural taste of the soup to come through. Simmer the soup for 20 minutes with the lid on. Cook according to package directions, then drain and rinse. 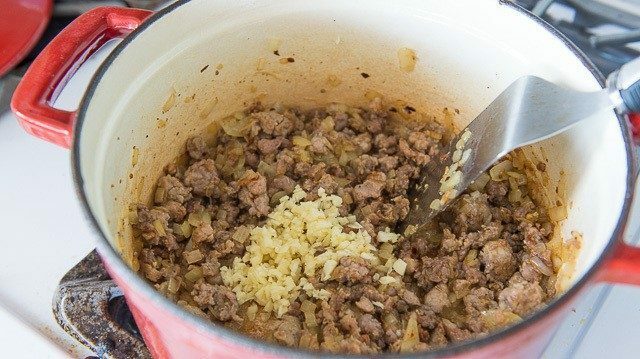 Here’s a full video on how to make the lasagna soup from start to finish, and the full recipe is below. Happy soup making! 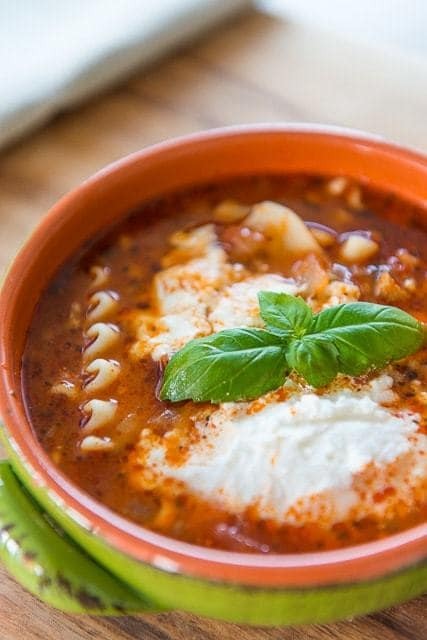 Cheesy Lasagna Soup is perfect for a quick and easy weeknight dinner! Made with Italian sausage, ricotta, tomatoes, and mozzarella. 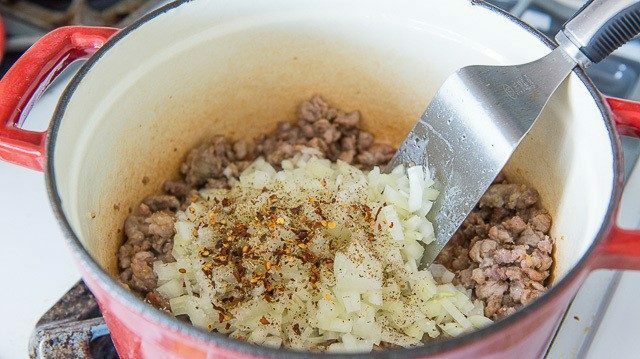 Heat a large pot over medium high heat, then add the olive oil and the pork sausage. 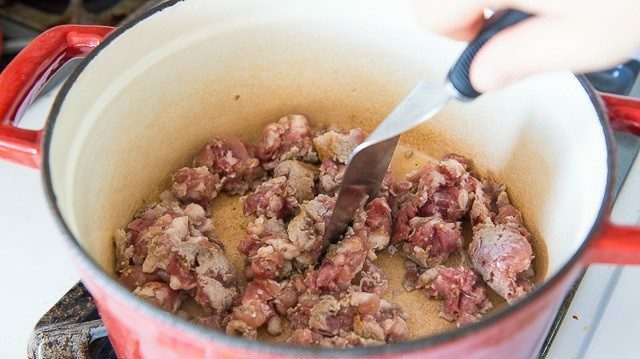 Brown and fully cook the sausage for about 5 minutes, using a spatula to break the meat up into small pieces as it cooks. 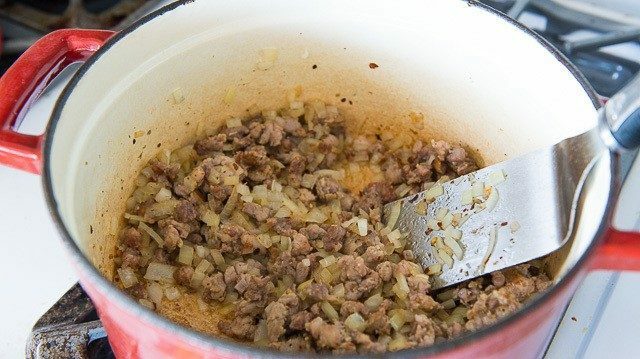 When the sausage is completely cooked, turn the heat down to medium and add the yellow onion. 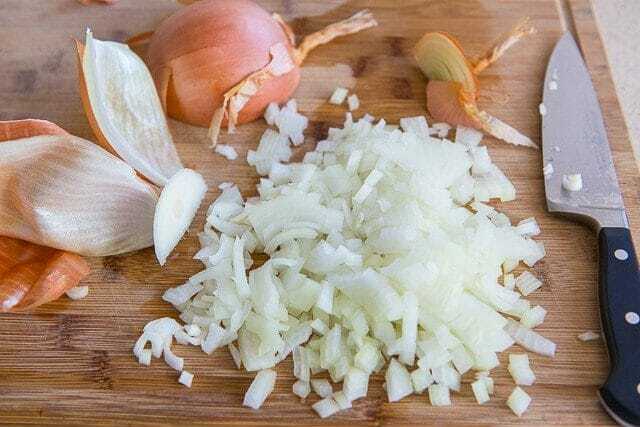 Season with 1/2 teaspoon salt, 1/4 teaspoon black pepper, oregano, and red pepper flakes, and cook for 10 minutes, until the onion is soft and translucent. Add the garlic, stir and cook for 1 minute, then add the marinara sauce, tomato paste, bay leaf, and Swanson® Unsalted Chicken Broth. Bring to a boil, then reduce to a simmer, and put the lid on. Let the soup simmer, covered, for 20 minutes. 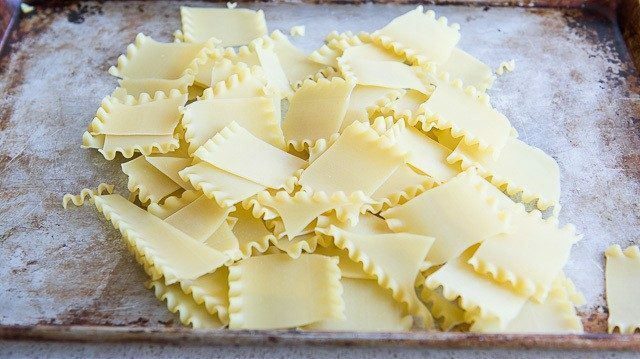 In the meantime, cook the lasagna noodles in a separate pot. Bring a pot of water to a boil, season the water generously with salt, then cook the lasagna noodles according to package directions. When done cooking, drain and rinse the lasagna noodles, and set aside. When the soup has finished simmering, check for seasoning by tasting the soup. Add more salt or pepper, if desired. 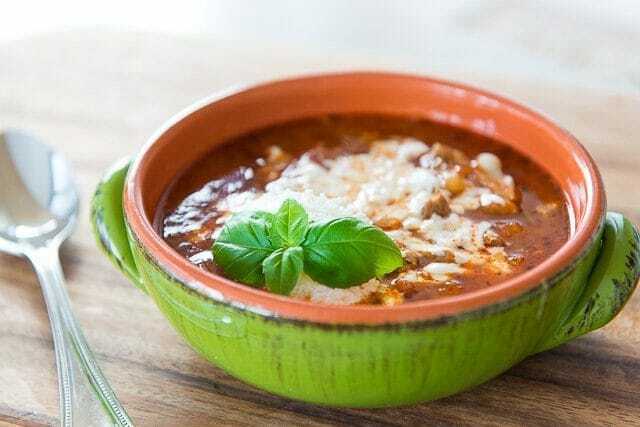 When ready to assemble the lasagna soup, place some lasagna noodles into the bottom of each bowl, ladle the lasagna soup on top, then top with a sprinkle of mozzarella cheese, a big spoonful of ricotta, and a sprinkle of basil. Serve and enjoy! Disclosure: This post is sponsored by Swanson®. I love their broths and have used their products in my cooking for years. All opinions are my own. Made this Lasagna soup for my family last weekend, 5 days later they are already asking for me to make it again. Definitely a keeper. That is so wonderful, Connie. YAY!! We thought this sounded tasty and quick to make, but I have a knack for making quick things take twice as long as they should. We were so surprised when it took exactly the amount of time listed in the recipe and tasted delicious. 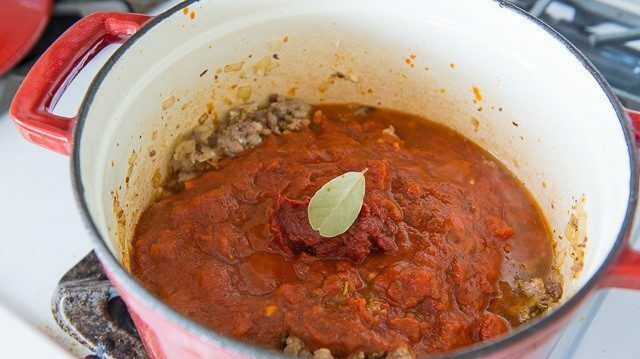 Oh, and we loved that it used up three tablespoons of tomato sauce…does anyone else have little balls of frozen tomato paste that they forget to use? Thank you, Joanne, for a new recipe that we will make over and over again. Hi Tracie, that is so wonderful!!!! And yes, I have tomato paste in my freezer pretty much all the time, from partially used cans. Works perfect for recipes like this! This soup is AMAZING! I will be having this all fall and winter long.